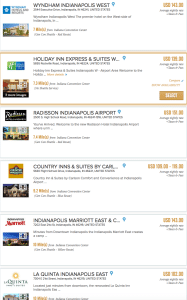 Every year my cohorts and I stand by, waiting for the nanosecond that the Gencon reservation system allows us to book rooms. We all press the button and surge forth to fight off the hordes of gamers trying to get in the system first and score prime hotels. Every year, we do really well and get our first choice. We are patient, organized and highly motivated, so the surge of people does not cause us an issue. So, in my case I wait 84 minutes and then I can book a room from the hotel block. This is critical because non-con block rooms are significantly more expensive on average. 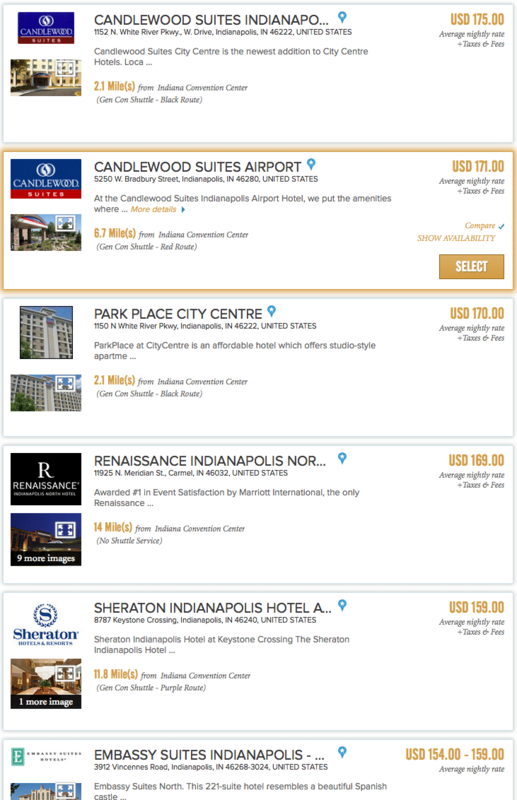 Happily, my Gencon roommates got a better time than me (8 minutes) and got our first choice for hotels. That said, we did hang on the line to see how quickly the rooms sold out. 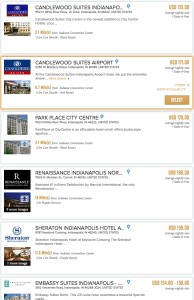 Here is the hotel listing at the 1:25 minute mark, sorted from most expensive to cheapest. The JW Marriot has a good location, especially because it has many of the RPG events in the building. Staying in that hotel is a good option for many people, though the price is a bit higher than other, already sold out properties. So, at the 1:25 minute mark there is a downtown property and the next two are vaguely close. Not a walkable distance though. I checked again at the 1:53 mark, again sorted by most expensive to cheapest. Things look bleak at this point. Best case scenario is three miles away with most properties either out by the airport or North of the convention center (10+ miles away). At 2:12 after registration opened, I grabbed a final list, this time sorted by proximity to the convention center, closest property first. I refer to this sampling as “The Fuckening,” for very obvious reasons. Your best case at the 2:12 mark is seven miles away. It just get worse from there. 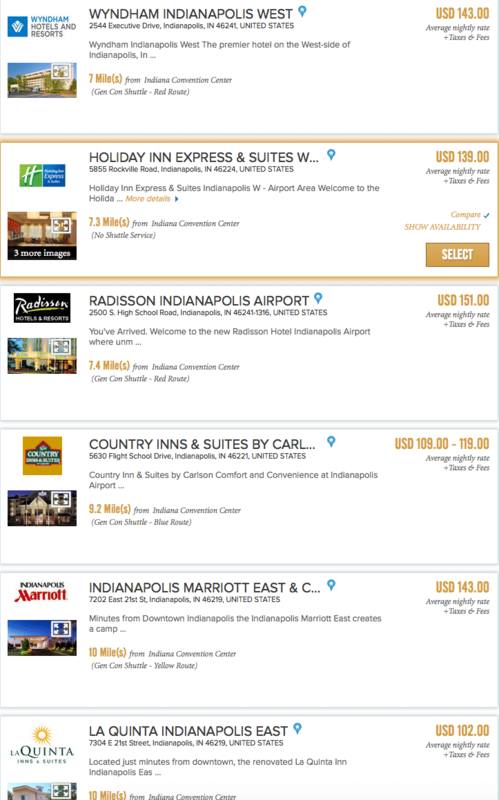 Bottom line is that the new Gencon hotel registration system is brutally fair and very, very cruel. Either you (or someone in your room) gets a room registration slot in the first 90 minutes or forget about downtown (skywalk connected anyway.) For those that have not attended before, commuting in and out of downtown or using the shuttles is quite the hassle and consumes both time and money. Both of which are precious at a yearly event. Now, on to my rant. Some gamers gripe that new system penalizes long-time attendees that knew the system, that organized hotel registrations like a military campaign. No argument from me. It does. 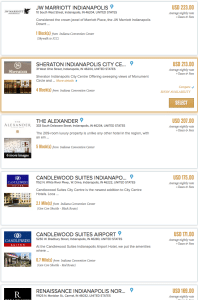 It penalizes dedicated and organized attendees in favor of everyone getting a fair shot at the prime hotel rooms. Equality uber alles! While the new system is fair it does raise an interesting question. The hard-core, dedicated attendee is now treated just like a first-timer. I could never prove, but believe that most large conventions have a dedicated core of game masters and game organizers that provide the majority of the events year after year. Given twitter is aflutter with people saying they are not going because of awful hotel draws and everyone had an equal chance, does that mean game masters are getting pushed out? Not just this year, but over the long term because of bad luck on a raffle? I hate to think that experienced game masters lost out to non-gaming cosplayers. Yes, I have no problem at all dumping whole categories of non-gaming attendees if it comes to it. Gencon is about gaming, if there is space for other, vaguely related events, great. Otherwise, jettison everything but the gaming. 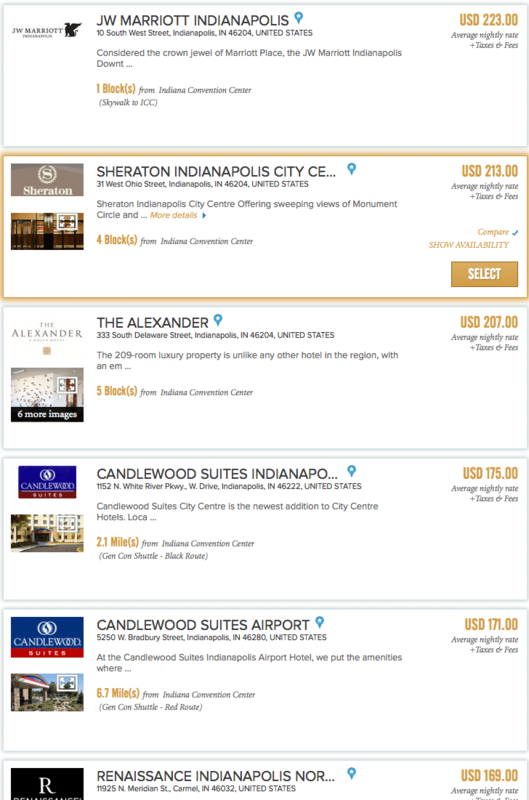 Oh, and there is a rumor flying around that people that bought badges after the hotel raffle started got in to the hotel booking system immediately. Just a rumor, but a guaranteed pitchfork wielding mob generator if true. If anyone did this, I would love to get confirmation this happened. If you missed out, keep checking back. There are reports of rooms opening up as people cancel reservations so do not give up hope yet. Good luck. Gen Con 2013 Events are up! May 8, 2013 trask Comments Off on Gen Con 2013 Events are up!